Born: September 3, 1817 in Sandwich Ma. Died: November 16, 1898 in Bourne Ma. at 81 yrs, 2 mos, 3d. 1. Ellen F. Raymond; (January 13, 1841 – February 9, 1905); Ellen died at 64 yrs. & is buried in Pocasset Cemetery. 2. Mercy Ann Raymond Kendrick; (March 11, 1843 – September 16, 1936); Married Henry H. Kendrick (1840 – 1884) (Daniel Herbert Kendrick & Harriet Dexter) in Sandwich Ma. 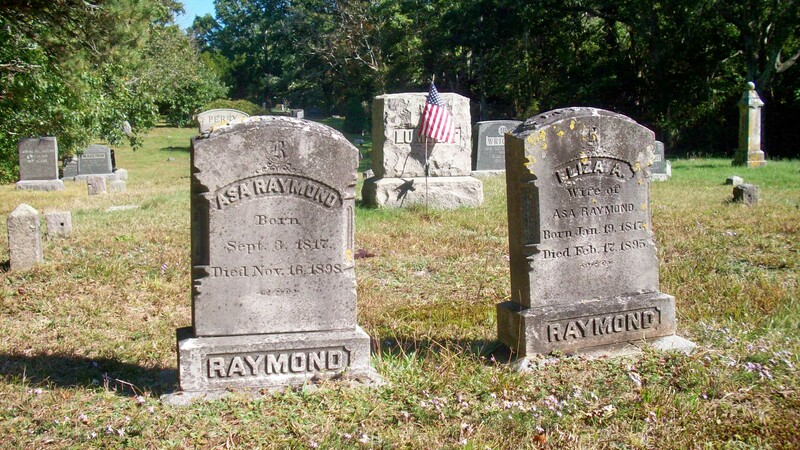 on December 20, 1868; They had 2 children; Mercy & Henry are buried in Pocasset Cemetery. 3. Melissa Raymond Lumbert; (March 9, 1845 – February 20, 1937); Married William Lumbert (1838 – 1913) (Ansel Lumbert & Clarinda Wright) in Sandwich Ma. on September 1, 1864; They had 2 children; Melissa & William are buried in Pocasset Cemetery. 4. Adeline/Addie Raymond Kendrick; (February 27, 1847 – January 22, 1941); Married Charles Everett Kendrick (1846 – 1920) (Warren Kendrick & Bethia Phillips) in Sandwich Ma. on January 12, 1868; Adeline/Addie & Charles are buried in Pocasset Cemetery. 5. 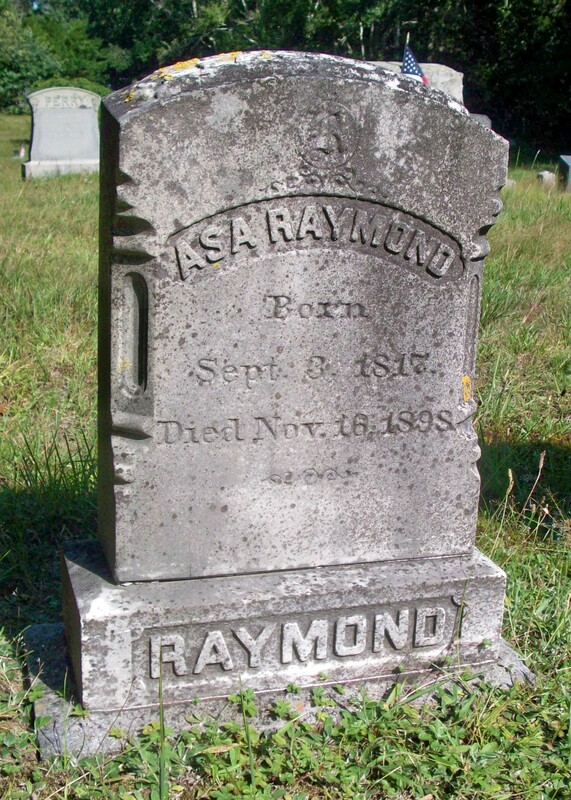 Albert A. Raymond; (July 21, 1849 – October 10, 1881); Albert died in Fall River Ma. at 32 yrs, 2 mos, 19 d..
6. Lucy Emma Raymond; (November 17, 1851 – December 2, 1918); Lucy died at 67 yrs, 1 mo, 14 d.; She is buried in Pocasset Cemetery. 7. William H. Raymond; (December 13, 1854 – November 26, 1924); Married Lelia Etta Childs (1856 – 1926) (Peter Eldridge Childs & Cordelia F. Smalley) in Falmouth Ma. on May 29, 1884; William & Lelia are buried in Pocasset Cemetery. 8. Lewis C. Raymond; (July 19, 1857 – ? ); Married Olive K. Benson (1857 – ?) (John W. Benson & Mary B. (–)) in Sandwich on December 29, 1881; Lewis was a Clerk & they lived at Summer St. in Pocasset Ma..
9. Cora Blanche Raymond; (May 13, 1860 – January 20, 1862); Cora died at 1 yr, 8 mos, 7 d.; She is buried in Pocasset Cemetery.